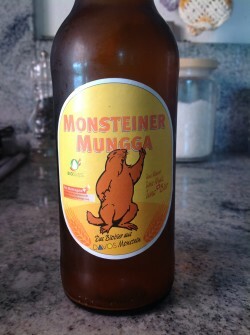 Organic Beer from Graubunden. Made with Alpin organic grain, and hops. UPDATED: SEP 9, 2018 Uit de fles. Bier stinkt. Smaakt raar, stal, niet best. Te veel koolzuurgas. Bottle. Hazy orange beer with a small white head. Aroma is malty with notes of caramel, corn, toffee and wheat. Flavor is malty with notes of caramel, toffee, corn and wheat. Sweet. Aroma slightly floral, weakly yeasty. Fairly sweet, floral, with lingering sweet aftertaste. Not good. Aroma of weak cardboard and orange water. Has little head and an orange body with heavy carbonation. Flavour is soft malt and sugar grain notes with no complexity. Weak on the mouth. Boring on every level. What is the point of this? 0,33l Flasche. Trübes gelbes Bier, weisser Schaum. Es riecht nach Hefeteig mit einem Hauch Zitrone und Gras. Herb getreidiger etwas wässeriger Antrunk. Dann Säure und Metall. Schönes Konzept für dieses Bier, aber leider ist es mir geschmacklich zu flach. Hat was von einem Weizenbier-Schorle. Bottle from Coop. Pours slightly cloudy yellow with a medium head. Aroma is spent pale malts, grains, low butter. Body is light and dominated by a crisp carbonation, followed by a rather thin malt sweetness. Dough, grains, straw. Dry palate, watery. Good as a simple summer refresher. Mutno narančasta boja, dosta slatkasta i blaga piva. Ima samo 3.5% alk. Jedino fora n aovoj pivi je ovaj svizac na etiketi. I bought this bottle from the Coop in Luzern and I drank it at home yesteday. On my personnal view, it is an average beer, not bad, not extraordinary, classical, on the Austrian way. The color is yellow/gold, the carbonation a bit higher than usual, thin and white foam. The taste is really bready, malty, a little notes of hop. The negative side is that there is a side metalic, but it is acceptable.